sometimes creeps healthbar doesnt display last hit at all, as if I dont use script. That can happen for the next creep wave if u reloaded assembly in game, otherwise it should work. Do you plan on auto executing combo? Like holding key and do the skills? Would be great for some heroes like sky,zeus etc that has low cd on some spells. I think its better to auto skill than manually skilling to kill creeps. Auto attack/skill while pressing key would be great. Im not planing to do it, at least for now. I dont reload assembly in game at all and sometimes it's happens without it. I heard there is a bug when assemblies gets reloaded at 0min mark. I can make temp fix to make this assembly work correctly after reload. Can we get an option to disable tower healthbar or a seperate option to move the tower healthbar? Added separate hp control. Also added tower damage abilities. skill marker for zeus' arc lightening seems to show up too early at 1-2 level. For me it shows up correctly. Note that red border is when u need one more auto attack hit, green is when u can kill it. Hp bars now will be ordered by distance to mouse. Actually, im not sure, maybe they should be ordered by hp. Here is some experience after playing with the script in several high MMR games. The assembly is great but it's kind of not perfect, first blight stone armor reduction is not calculated before the hit is landed. Also the refresh rate (1/750ms) is too low for competitive play in some situations e.g. Templar Assassin/Invoker . The optimal solution is to update auto attack damage right after refraction/exort applied, because so many times you will use refraction or exort right at the last moment within an <750ms time window. (I tried 100ms and it's acceptable.) Please improve the assembly because it is really one of the best last hit assemblies around. Ive added damage recalculation when modifier added/removed so it should feel better now. As for blight stone, its increasing damage by ~1 and only for 1st hit so i dont think its worth adding. FYI: The Blight Stone increases attack damage by about 11%. Works against allied units. Okay, but unfortunately Ensage.Common damage calculation is not working with this pre minus armor stats, so i can just make approximate damage increase. Go to clh marker menu > auto attack > health bar and adjust position/size. have you tried to install ensage_ui textures? It has helped me with the same problem. This script doesn't work with viper, while working preety good with other characters. According to the error log, the problem is in the "nethertoxin" skill. Disabling ability damage prediction changes nothing. What should i do? How can I make the health bars SMALLER overall? When you zoom out, the bars get larger in proportion to the creeps. Also, I am having the problem that the original bars remain and so i have 2 health bars per creep. Is it possible to make hero health bars smaller also??? essentially we are "covering up" the original creep health bar. 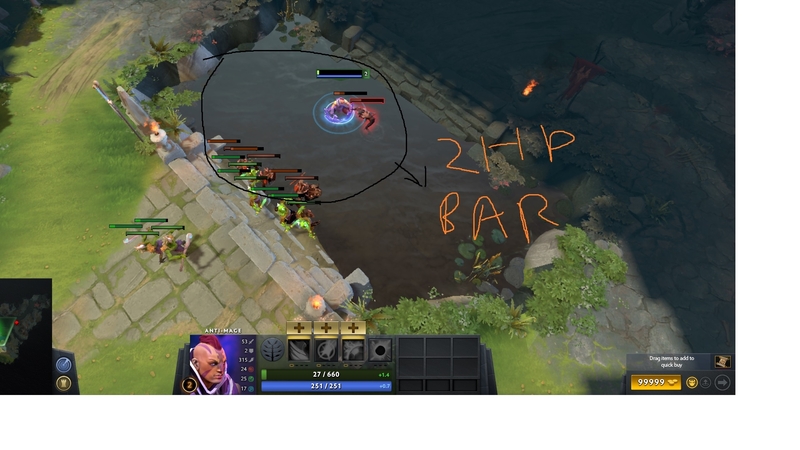 i want to make the creep bars smaller and thinner and remove entirely the original creep bar. is it possible?